Bf 109D serial number 434 crashed near Kjellerup 22/6 1942. Apparently the aircraft went into a spin and crashed at a field belonging to “Konsulentgaarden” farm near Kjellerup. The Bf 109 was 90% damaged and Unteroffizier Paul Eichen was found sitting in the cockpit without his shoulder harness and a smashed skull from hitting the instrument panel. He had tied the seat belt around his as there had apparently been problems with the belt buckle. 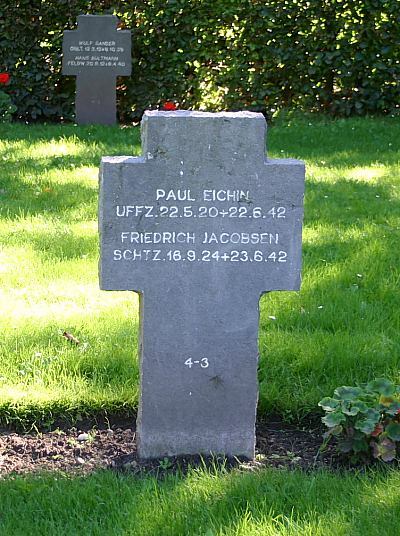 He was laid to rest in Esbjerg Fovrfelt cemetery on 26/6 1942. Sources: RL 2 III/761, BE.